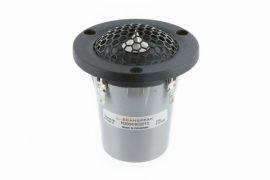 Compact tweeter with 1″ soft ring dome with large non-resonant rear chamber and patented phase plug. The small size of Scan-Speak R3004/602010 is employed without compromising sound quality, which is fully comparable to the full size Illuminator and Revelator tweeters. Compact face plate ans sound transparant protective grill allows to use the R3004/602010 in a very wide range of home speaker systems and car audio systems as well. Illuminator R3004/602010 fetures also patented Symmetrical Drive (SD-2) motor with neonymium magnet and patented phase plug design.